Proudly bearing its legacy as site of the 1960 Olympic Winter Games, Squaw Valley USA is located near the California/Nevada border just minutes from the north shore of Lake Tahoe, and a 45-minute drive from downtown Reno. The slopes at Squaw Valley USA are so compelling that the Olympic Games were attracted solely by its natural environment climate, colors and canyons. And views from the top of the mountain stretch out across Lake Tahoe as far as the eye can see. With a reputation as one of North America's meccas for extreme mountain sports, Squaw Valley USA is a challenging place where skiers, snowboarders and mountain bikers practice their skill until it becomes art. It's also a place where aspiring talents can watch these wild arts being performed in strikingly beautiful natural surroundings. Seemingly at the top of the world, High Camp is synonymous with Squaw Valley USA. Take a cable car to 8,200 feet where you can swim in a lagoon, relax in the spa, play tennis, enjoy the museum and restaurants, or take in the spectacular views. Also at High Camp is the Olympic Ice Pavilion, open year round. Revel in the exhilaration of ice skating at the top of the world, overlooking the awe-inspiring Lake Tahoe. Straddling two state borders, the Cal-Nev Lodge is a beautifully restored historic casino at nearby Crystal Bay. Or check out downtown Truckee on Highway C-18. Its vintage storefront facades and covered wooden walkways provide an historic atmosphere for browsing. If you're feeling lucky, try your hand at one of Reno's thousands of casinos. The "Biggest Little City in the World" is always open for fun! 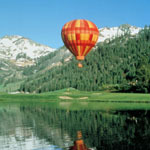 For more information on Squaw Valley, click here. Squaw Valley - Could it be the 8th Wonder of the World? Located near the California/Nevada border, Squaw Valley USA is a spectacular four season playground - one visit and you'll understand why. With awe-inspiring views, grand mountains and spectacular terrain, The Village at Squaw Valley USA is one of a host of world-famous ski resorts surrounding Lake Tahoe. The sight of the 1960 Olympic Winter Games, the Olympic torch marks the entrance to the resort just minutes from the North Shore. Skiers standing at the summit can look across the massive lake at the twinkling lights on the lift towers of neighboring resorts. During the summer, The Village at Squaw Valley USA is a complete one-stop playground, with activities and events just outside your door. Take a cable car ride to "High Camp", 2, 000 feet above base of the mountain where you can swim in the Lagoon, relax at the Spa or simply take in the spectacular view, from the top of Squaw Valley USA. Looking for a more active way to spend the day? How about a game of tennis at 8,200 feet, a tour of the mountain on a bike (try the 3.2 mile/7km mountain run), or hike through one of the many trails. Sunset is a perfect time to try an evening hike and gaze at the stars. High Camp also boasts the Umbrella Bar and Alexander's Restaurants, a world-class restaurant where the food is as good as the view. Cal-Neve Lodge — the beautiful restored historic casino at Crystal Bay straddles two state borders and contains the Washoe Indian historical display. Fanny Bridge — over the Truckee River at the "Y" in Tahoe City, this is Lake Tahoe's only outlet and a perfect place to watch the fish frolic. Scenic Highway 431 Overlook — this pullout on the Mt. Rose Highway has a series of plaques pointing out the major resorts and mountain peaks and provides one of the best panoramic views of Lake Tahoe. Historic Downtown Truckee — storefront facades and covered wooden walkways combine with many vintage original Truckee buildings to provide an eclectic atmosphere for some of the area's most trendy shops, bars and restaurants. Reno Arch — spanning casino row on Virginia Street, this glittering famous Reno landmark welcomes visitors to "the Biggest Little City in the World". William F. Harrah Foundation — a display of antique, vintage and classic automobiles. Liberty Belle Saloon Slot Machine Collection — in the heart of "casino row", a rare collection of historic and antique slot machines. a great place to spend a vacation - any time of the year! Take Interstate 80 East towards Reno. Stay on I-80 until you reach Truckee, about 10 minutes after you have crossed Donner Summit. Take the Highway 89 South Exit towards Squaw Valley and South Lake Tahoe. Continue south on 89 until you reach the traffic light at the Squaw Valley entrance and turn right onto Squaw Valley Road. Take Interstate 80 West toward Sacramento. Stay on I-80 until you Reach Truckee, about 30 minutes West of Reno. Take the Highway 89 South exit towards Squaw Valley and South Lake Tahoe. Continue south on 89 until you reach the traffic light at the Squaw Valley Entrance and turn right onto Squaw Valley Road.